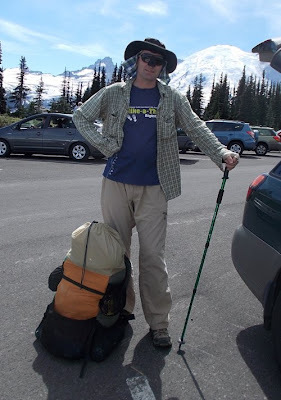 Another Long Walk: Day 1: Permission to Hike the Wonderland Trail, Sir! 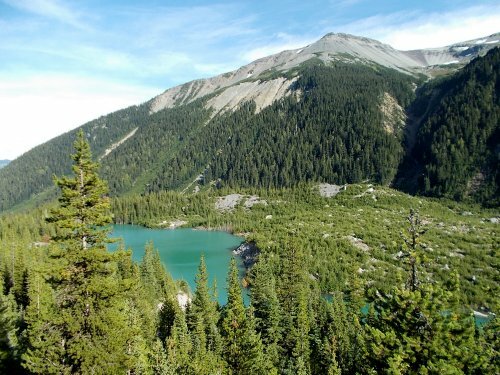 Day 1: Permission to Hike the Wonderland Trail, Sir! I'm prepared to start my Wonderland Trail hike. bear canister which I planned to stash in the woods. 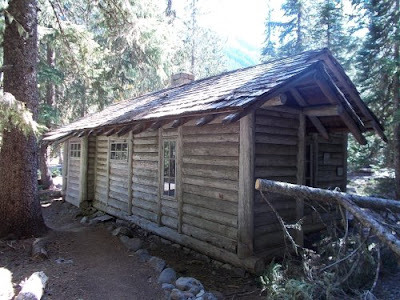 Amanda and I walked into the Carbon River ranger station. I needed a permit. 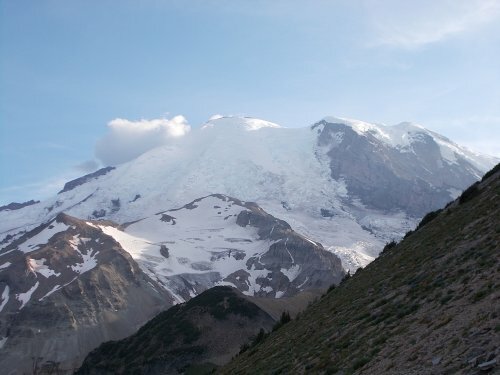 My plan was to thru-hike the Wonderland Trail, a 93-mile trail looping around Mount Rainier--the highest point in Washington which peaks at over 14,000 feet above sea level. I've done this trail before. I've even failed this trail before--the only thru-hiked I've failed to complete. It can be a tough little trail. But as the name of the trail suggests, it's absolutely incredible with one wondrous view after another. And I had absolutely no desire to ever hike this trail again for as long as I lived. Not because it wasn't a wonderful trail, but rather I hate the rigidness permit system. Space in campgrounds are very limited, you are required to camp at the campgrounds and you have to pick out every single campsite for the entire trip before you even step foot on the trail. It's not very flexible. If you're hurting, you can't slow down. If you're going so slow that you're bored to tears, you can't speed up. If the weather turns bad, you can't make a short day of it. You're stuck with whatever you selected before you even stepped foot on the trail. I hate this system. I'm used to sleeping almost anywhere I want in the backcountry, going at my own speed and waking up in the morning not being entirely sure where I might camp at the end of the day. 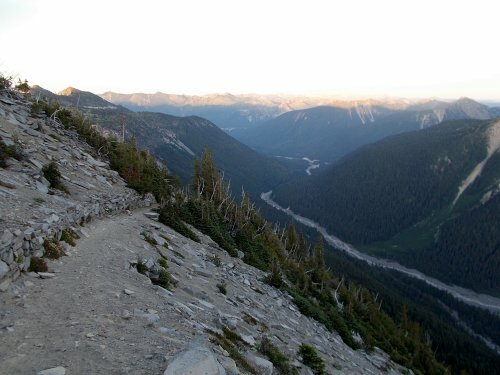 And that's why I swore to myself that I would never, ever try to thru-hike the Wonderland Trail again. Anyhow, why should I? I'd already done it before and there are so many other trails I'd like to hike. I never had any reason to hike it again! Until walking4fun.com came along, that is. Almost since the day I created that site, I've had countless people ask me when I was going to add the Wonderland Trail. It would be a wonderful trail to add--no pun intended! But I had other trails to occupy my time. I wouldn't rule it out, but it might be awhile..... In the meantime, I was going to do the Colorado Trail this summer. Until I learned that wildfires had closed about 20% of that trail. Then I decided to replace it at the last minute with the Tahoe Rim Trail, which I've always wanted to do anyhow. But that was a mere 165-mile trail. I needed more than that.... So heck, why not--may was well do the Wonderland Trail too. Which is how Amanda and I ended up at the ranger station at Carbon River with me trying to finaggle a permit to thru-hike the Wonderland Trail. 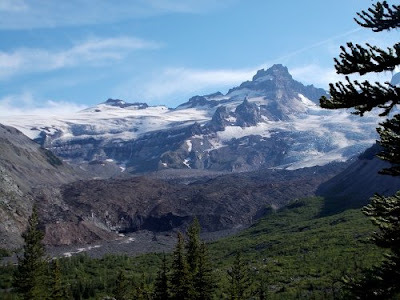 When I explained what I wanted--a permit to thru-hike the Wonderland Trail--he asked if I was feeling lucky and had played the lotto, pointing to a large map on the side wall with the status of the campsites all around the mountain. There were a lot of white little stickers that read "Full" all over that thing. Two of them, Paradise and Sunrise, still had space, though. starts where the glacier ends. "Do you have an itinerary?" the ranger asked me. "No," I replied. Why would I bother to create an itinerary when I didn't even know what campsites would even be available? It would have been dead in the water from the very first day! The ranger seemed surprised that I wouldn't have an itinerary, and quite negative about my chances of working something out. "I guess I'll have to take Sunrise the first night," I told the man. The Paradise campsite I wasn't even sure was on the Wonderland Trail. Paradise, I knew was not, but even if the campsite were on the Wonderland, it didn't really matter much to me because I wanted to hike around the northern part of the mountain twice. There was the Wonderland that connected Sunrise to Mowich Lake, but a second set of trails along the Northern Loop and Spray Park also connected the two, and I wanted to do them both. I needed to start from Sunrise or Mowich Lake if I wanted to do them both with no overlapping trail. So Paradise, on the south side of the mountain, was a non-starter for me. "Yeah, I guess I'll just have to crash at Sunrise tonight," I told the man. This wasn't my ideal situation because from the trailhead at Sunrise to Sunrise Camp was only about a mile. The idea of hiking one mile to my destination for the night was a little underwhelming, but it looked like I didn't have any other options, so I took it. "What's sites are available the next night?" I asked. "Okay, then, I'll take Mystic the second night." That looked like it would roughly be about 10 miles on the map, just eyeballing things. Probably not quite as long as I would have preferred, but at least it was an improvement over the 1 mile hike I'd have to do today. Once I got past those first few days, the campsites camp quickly and easily and I had no trouble picking whatever I wanted. They reserved about 30% of the campsites for walk-ins such as myself, so once you get through those first few nights, the rest of the campsites almost all have plenty of room. And I wound up with a schedule that would take me 1 1/2 times around the mountain, starting at Sunrise, walking counter-clockwise around the mountain over 10 days (9 nights). I estimated that I'd cover, roughly speaking, about 120 miles. After the permit was printed and I signed the necessary forms, the ranger asked me if I played the lotto--seeming to imply that I was really lucky to get something at all. There's always something available if you're willing to be flexible, though, so I wasn't really all that impressed with my feat. In fact, I was still more than a little disappointed that I had about eight hours to walk about about 1 mile to my campsite. That was completely unacceptable in my book! Well, okay, maybe something a little less than 8 hours. After all, now I needed to get to Sunrise which was at least a solid hour of driving away. Maybe more. The roads around Mount Rainier aren't exactly Interstate highways, after all. Amanda and I stopped at Taco Time for lunch in Enumclaw where I pulled out my maps and my permit and started calculating exactly how far I had to walk each of my 10 days on the trail and I discovered a small little problem near the end where I had to walk about 20 miles from Summerland to James Lake then barely even 8 miles from James Lake to Ipsut Creek. I might be able to pull off a 20-mile day, but I'd rather do two consecutive 14-mile days. That was more my style on this sort of terrain, and there was another campsite at Fire Creek that better split the those two days of walking. And since it was near the end of my trip, I had little doubt I could make that sort of change. Fire Creek is probably never full more than a week in advance! 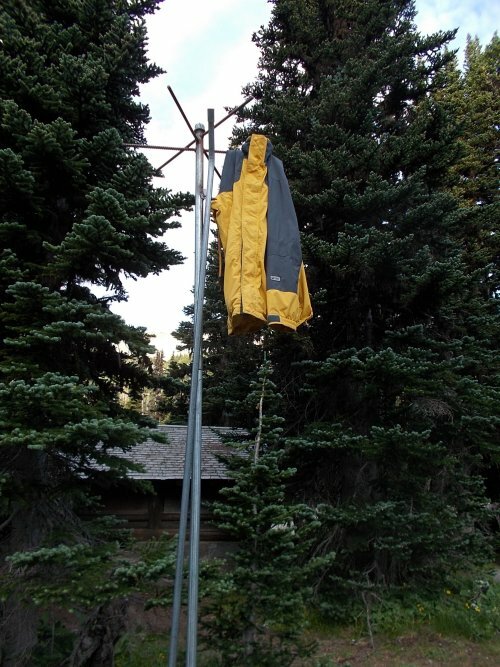 So we stopped at the White River ranger station on the way to Sunrise and I asked if I could adjust that particular night from James Lake to Fire Creek, and the ranger looked it up on her computer and said, "Yes, not a problem." She crossed out James Lake and wrote in Fire Creek with a pencil and I was good to go. Then off we continued to the Sunrise complex. Finally, I could start hiking! But I still had a problem with a mere 1-mile hike to camp. I needed more than that and looked over my map for options. There were a lot of trails in the Sunrise area of Mount Rainier and I could easily spend the whole afternoon taking various side trips to kill the time. But eventually, I decided to do a loop. I'd walk down to White River for a couple of miles along the Wonderland Trail--the very same section of trail I'd be walking back up a week from today--but then head off down the Glacier Basin Trail to the Burroughs Mountain Trail to the Sunrise Rim Trail which would take me right into the Sunrise Campsite. About 9.4 miles total, according to my topo map. And all of it would be completely new for me, except the 2.6 miles along the Wonderland Trail to White River which I'd be doing in another week anyhow. But, I quickly realized, I could take advantage of the fact that I'd be hiking this same trail a week later. I had my bear canister in the car. The Wonderland Trail doesn't require that people use bear canisters since bear poles are available at all of the campsites, but I had a bear canister in the car and I could fill it full of food and stash the bear canister in the woods to pick up a week later when I passed through again. The bear canister would need three days (two nights) of food to get me the rest of the way to Mowich Lake, if everything went well, and by hiding it here, I wouldn't have to carry it completely around Mount Rainier. It should be pretty safe in the bear canister which wasn't only bear proof, but also waterproof. So I packed the bear canister with the necessary amounts of food, stuffed it into my pack, and headed down the trail. Amanda followed me about half a mile before she turned back. She was in Seattle on a layover and needed to go back to work. In two more nights, though, I'd be camped at Mowich and she planned to meet me there to camp for the night. Mowich was one of the few campsites on the trail she could actually drive to. to attack wildfires, track poachers and provide aid to travelers. Once I got into the Wonderland Trail proper and away from Sunrise, I started looking for a place to stash the bear canister immediately. The trail dropped about 2,500 feet from Sunrise to White River--a very steep section of trail, and the sooner I dropped off the food canister, the closer it would be to the top of the slope. I'd rather pick it up at the top of the slope a week from now than have to pick it up at the bottom of the slope and carry it all the way back up again! But finding a good place to hide the bear canister turned out to be more difficult than I thought. The slope the trail descended was sooo steep! I was afraid that anywhere I hid it, an animal might knock the bear canister loose and it would shoot down the hillside never to be seen again. I needed to hide it in a safe place, but they just didn't seem to exist. I also needed to put it near an obvious landmark so I could find it easily again a week later. A non-descript switchback in the middle of nowhere might be hard for me to find. Near a spectacular waterfall, however, would be impossible to miss. But I also couldn't leave it where other hikers might linger or discover by accident. 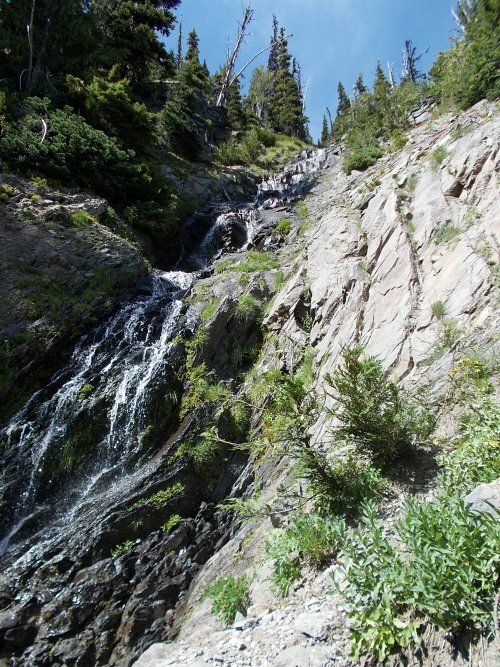 Eventually, I did leave the food cache near a waterfall--the biggest waterfall found between Sunrise and White River. The slope was steep, but I put under a low-hanging tree where I felt confident the bows of the lowest branches dug into the ground. They would hold the bear canister in place. Even if an animal could get to the bear canister--which might be hard for larger animals through all that brush--the low, thick trees would prevent the canister from sliding too far down the mountain. I also hid it above the trail. In the worst case, if an animal did somehow dislodge my bear canister, I'd rather have it fall onto the trail where passing hikers could rescue it (I did leave my name and contact information in the canister) than have it slide to oblivion never to be seen again. Once I reached White River, I read the signs describing the Glacier Basin Trail, and part of it described the Emmons Moraine Trail--a 1-mile off-shoot of the Glacier Basin Trail that I originally didn't plan to do because I was afraid I wouldn't have time to do it and still make it to Sunrise before dark, but the description was so enchanting, I immediately decided to do it anyhow. My 9.4-mile hike had just turned into a 11.4-mile hike. And dusk was quickly approaching. And I still needed to climb about 3,000 feet in elevation to get back to Sunrise Camp. I had to get moving! The Emmons Moraine Trail turned out to be a wonderful detour with incredible views of the Emmons Glacier and aqua-blue lakes below. 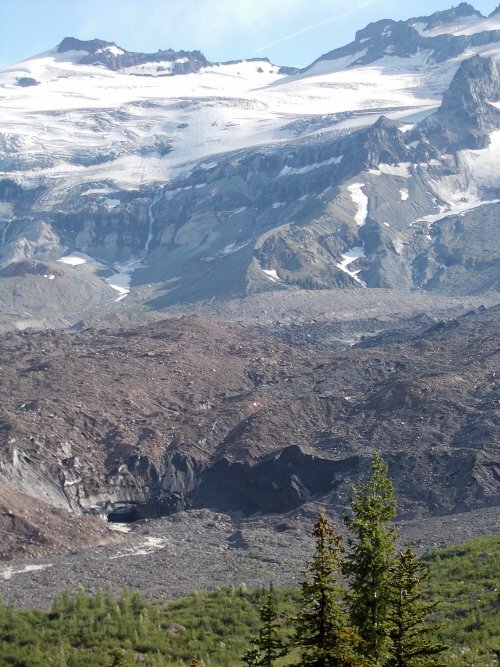 My first close-up view of a glacier on this hike. 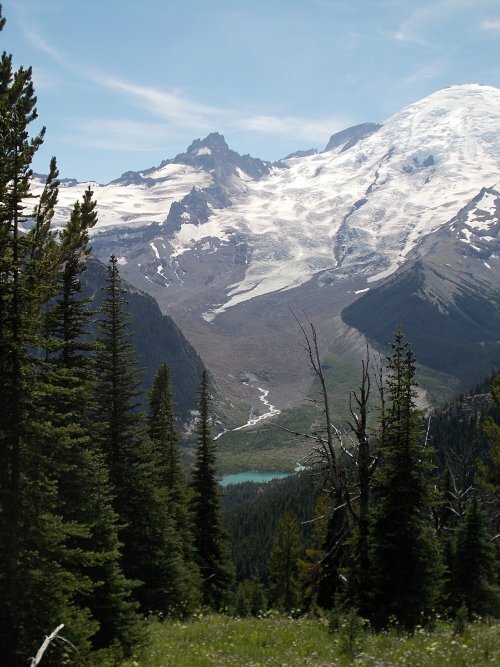 Once I joined the Burroughs Mountain Trail, the trail turned steeply upwards, gaining the altitude that I lost by descending the Wonderland Trail. It was an exhausting climb that had me huffing and buffing and sweating bullets even though the temperature couldn't have been much higher than 70 degrees. Much of the trail was already in shade with the sun tucked away on the other side of the high ridge. But it was a thigh-busting trail and I didn't see a single other person on it. 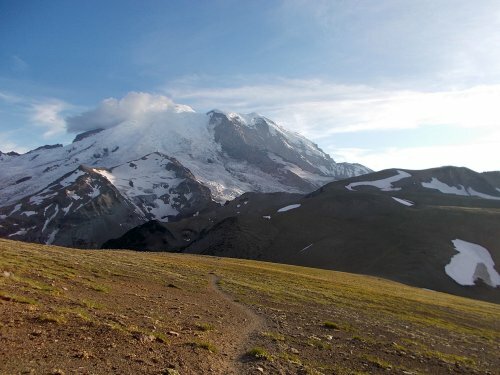 Once I reached the ridge of Burroughs Mountain, the trail leveled out, back in the sunlight, and had absolutely stunning views of Mount Rainier. "Yes," I thought to myself, "this was a good loop to take." 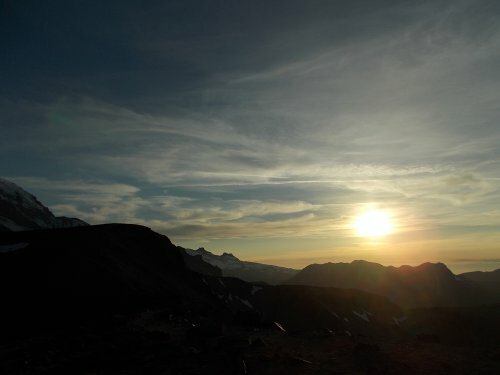 As I got close to Sunrise Camp, the sun finally set. It wasn't dark yet, but it would be soon. Near the campsite, my map wasn't especially detailed. They used a large, tent-shaped icon to represent the campsite, but if the icon was to scale, then the campsite would have covered about 20 acres! So I wasn't entirely sure exactly where the campsite was located, although it did appear to be immediately to the north and west of Shadow Lake. I arrived at an unlabeled trail junction and scratched my head trying to decide which way to go. On my map, it looked like the campsite was at this trail junction, but I saw no signs of a campground anywhere. Ahead, the trail seemed to follow along a very steep cliff and it seemed unlikely a campground would be hiding over there, while to the left, the trail passed near the edge of a meadow and I figured a campground could be hidden in a thicket of nearby trees that direction, so I headed in that direction. Turns out, I picked wrongly. I followed a trail which quickly had me second-guessing myself. There were places where the trail seemed less defined and faded in and out a lot more than I would have expected, and I wasn't finding any sign of a campsite at all. Where the heck did it go?! (4.3 square miles) of any glacier in the contiguous US. other debris.) It's now receding again. The next sign I saw pointed to Sunrise Camp, to the south, so I started following the trail south eventually finding the campsite. 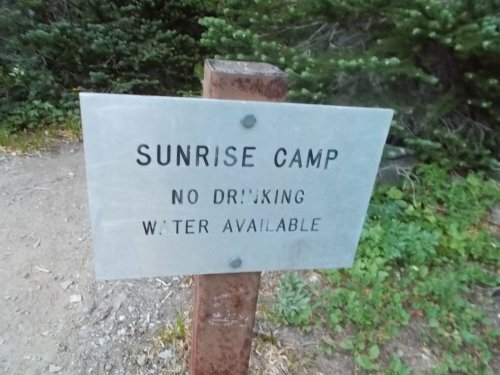 But there, another sign announced some more bad news: There was no drinking water at this campsite. WHAT?! I thought all of these campsites had water available! I didn't have enough water to make dinner tonight, or breakfast in the morning, or just replace all the water I sweated out climbing the Burroughs Mountain Trail! I needed water! And I sure as heck didn't want to walk a mile back to the Sunrise parking area (one way) to get it! Actually, I was so tired, and it was already after sunset now, and I didn't even feel like cooking dinner at all. I'll just eat the next day's lunch snacks. I had a short, barely 8-mile hike the next day, and I'd likely be bored to tears by the end of the day. I'd cook my dinner for lunch tomorrow to kill time. Yeah, that would work. The rest of my food, toothpaste, and other smelly items I put in a bag which I hung from the bear pole. Then I read my Kindle late into the night until I started feeling sleepy and headed off to sleep. show a name for the lake in the foreground. The steep climb up the Burroughs Mountain Trail has some beautiful views! Once I've reached the top of the ridge, I was back in sunlight again. Not that the sunlight would be lasting much longer. Sunset is quickly approaching! Monkey flowers on the trail! "There's always something available if you're willing to be flexible, though, so I wasn't really all that impressed with my feat." That may be but I think all of your readers are impressed with your FEET!